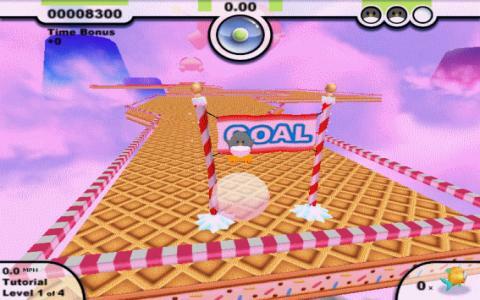 For fans of ball rolling games like Marble Madness and Rollin, Snowball Run makes for a nice addition to your collection. It's a simple enough idea but it's well executed and offers some light-hearted entertainment that keeps you playing until the end. 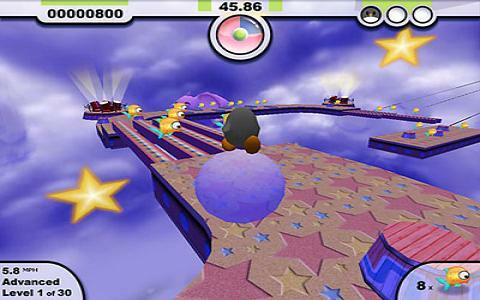 The game takes place in a sort of sky-based amusement park and places you in control of a penguin who is riding around on a snowball. It's basically your job to guide this penguin through the extensive set of levels while avoiding all the various hazards which litter your way. There are 75 levels to complete, which start out pretty simple but get complicated fairly rapidly, while the hazards include things like ramps, holes, and so on. Each level is played against the clock and the faster you complete them, the more points you rack up while you can also collect fish for extra points. You've only got a limited number of lives which can be lost by bouncing off hazards and then falling out of the level, for example. The background visuals include lots of colorful elements like elephants, candy stores, and so on. Snowball Run is far from being a complicated game but it certainly scores in the fun department. It's super easy to get into, thanks to the very intuitive controls which are also nice and responsive. The levels are well designed, with some nice challenges to overcome but which are rarely frustrating and which adds to the game's appeal. The visuals are also quite lovely, with lots of character thanks to the colorful backdrops, so if you're looking for a pleasant way to kill some time, this is a good option.